Patience, the wife of former President Goodluck Jonathan, has recovered her N2bn hotel which was sealed off by the Economic and Financial Crimes Commission in June, The Punch has learnt. 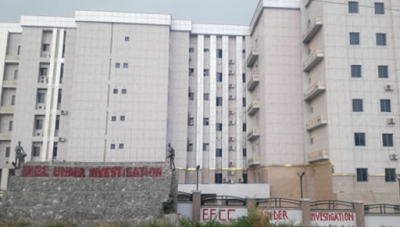 In June, the EFCC placed the red inscriptions, ‘EFCC Under Investigation’ all over the hotel which is located near Setraco Construction Company, off the Mabushi Kado Expressway. However, when Punch correspondent visited the five-storey building recently, the EFCC inscriptions had been covered with patches of grey paint. When Punch correspondent knocked on the gate, three men who attended to him said they acted on the instruction of Mrs. Jonathan. The spokesman for the EFCC, Mr. Wilson Uwujaren, said he did not know much about the seizure of the building and thus could not say if it had been returned to Patience or not. A source at the EFCC said it was wrong of Patience to have erased the EFCC inscription from the building. He said, “Sometimes when we are investigating some politically exposed persons, they immediately begin to sell off their buildings in order to cover their tracks and run away with the cash so that is why we put EFCC signs on the buildings so that innocent people will not buy those buildings.